2. Score a A4 Sheet of card for the middle sheet of card on the A4 Half fold line, and on the A4 Concertina line, turn card over and score again on the A4 Concertina line. 3. The Concertina fold card, need to be stuck in between the 2x C5 Cards. ( to form the book front and back covers.) so stick the 2 outside panels in between the C5 cards, with glue or Double sided tape. 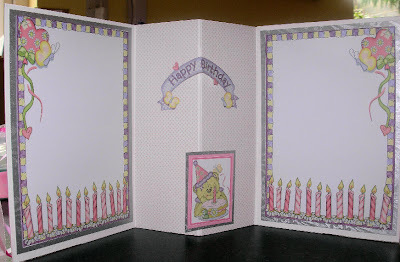 ( if it sits slightly over the spine if the middle card, it wont matter as it will still close and fit neatly in the envelope) Cut out the Birthday banner and fold in half, attach it to the spine of the card, But let it slightly over hand the spine, so that if pop-out when the card is open. 5. 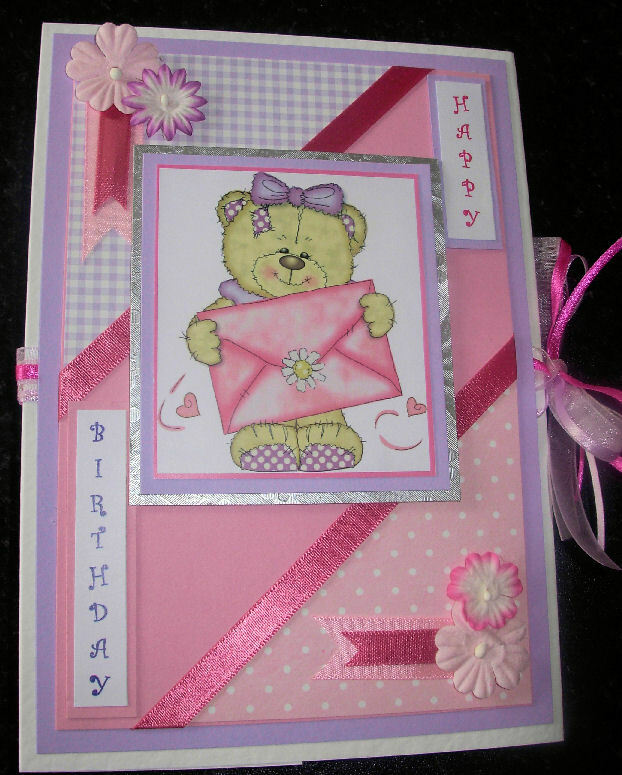 Stretch the card full open, (inside face down) and stick the 4 strip of ribbons right across the back with Double sided tape to the covers of the book, allow a tiny bit extra in the centre to allow the card to shut, Stick the larger pink and cream flowers over the ribbon in the concertina on either panel, to hold the ribbon in place. Stick the deep pink ribbon across the printed paper with narrow double sided tape, and bring the ends behind the pink card, secure the ribbon with extra tape. Matt this to the purple piece of card, and stick these to the front and back cover. 6. Matt and layer the teddy images onto lilac and silver card, matt the greeting on to the scrap card in your kit, Stick the Ribbon tails underneath flowers in your kit to each corner. 3. Stick the 14cm by 20cm sheet of printed paper to the gold card centrally. 4. Stick the 5cm by 20cm blue strip of card to the 6cm by 21cm strip of gold card, and stick this about 1 cm from the bottom of card. 5. 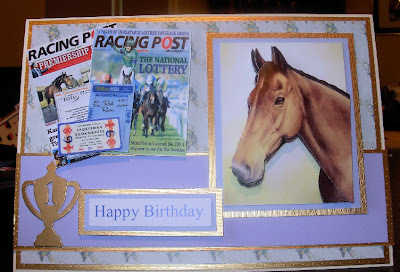 Cut out the main horse image and matt and layer to the blue card and then gold. 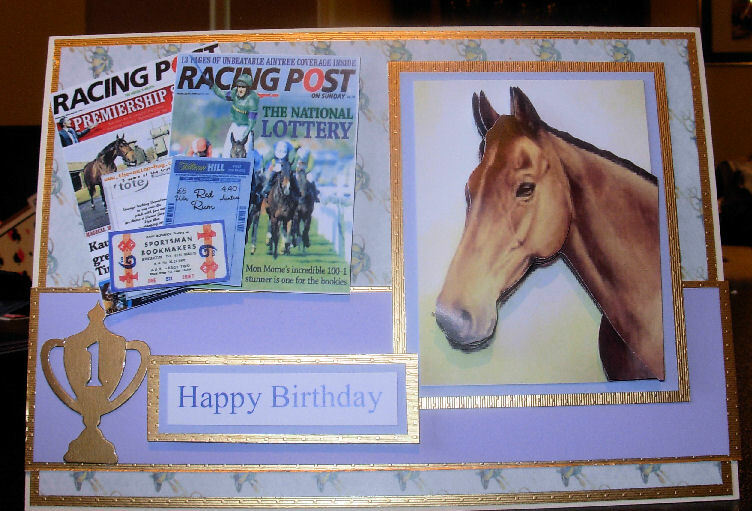 and stick it to the right hand side of card, overlapping the blue and gold strip.. add the decoupage layers to the horse. 6. Add the Racing memorabilia to the left hand side of card, I found the selection I used on Google images. 6. Matt and layer the greeting on to the blue card and then gold card. 7. Lastly stick the gold trophy to the left hand side of the blue and gold strip. Fantastic Yvonne! I didn't realise it was back as far as June. I was looking in September! How time flies! Just a quick hello today. I'm back looking at the instructions! My Uncle's birthday is next week and he loves the races!